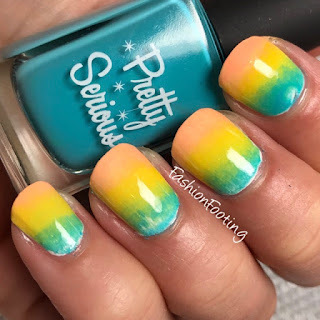 We've been having some seriously gorgeous weather lately and I saw the most beautiful sunset last week and was inspired to do a gradient for this prompt. And it just so happened that I had three Pretty Serious polishes sitting in my acrylic rack that were perfect for this sunset! I started with a white base and then sponged Pookie (blue), Honey Puff (yellow), and Peachie Poo (peach) onto my nails until I reached the desired opacity and then topped it off with topcoat. I thought about trying to draw some trees but you know how awful I am drawing trees so I decided to leave it as is, lol!